Juniorhandball.org Reports- The World Players of Handball was thrilled to present a Junior WPH handball clinic at the famed Stratosphere 3-WallBall court complex to kickoff the fifth installment of the WPH/WOR 3 Wallball World Championships. 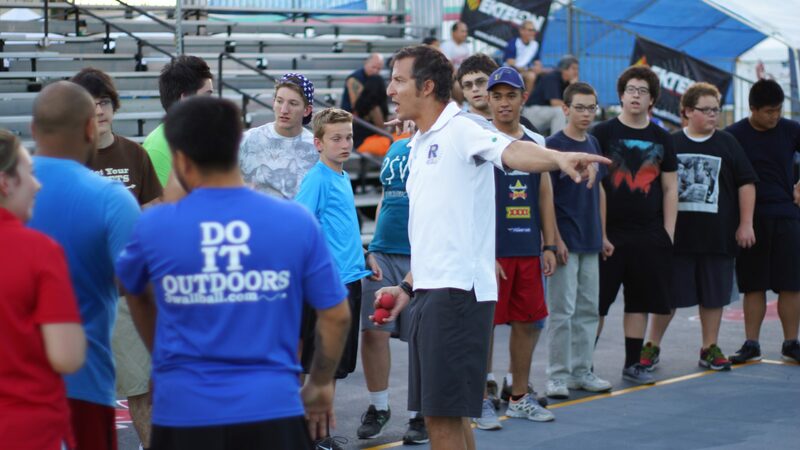 WPH Coaches David Fink, Aoife McCarthy, Sal Duenas and Shorty Ruiz introduced 15 Boy Scouts from neighboring Las Vegas suburbs to handball on the WPH/WOR 3 Wallball World Championship courts. The coaches demonstrated the handball stroke, followed by serving and kill shot games and ended the session with singles and doubles king of the court. The World Players of Handball hosts over 500 junior handball clinics per year across the United States with certified coaches that are trained to work with groups of all sizes, levels and ages. Junior WPH prides itself on presenting the most fun, most educational and most structured junior handball clinics in the world. Every aspect of the game of handball is covered in all Junior WPH handball clinics, including the rules, the warm-up, stroke instruction, drills, drill-based games, group games and cross training. The goal of Junior WPH is to inspire the next generation of handball players and we mandate that all of our instructors pass a rigorous series of exams before teaching clinics.